Red Lions striker Innocent Bokosi says he is confident that he will be the top goalscorer in the Super League this season. Speaking in an interview with Malawi24, Bokosi said he is grateful for the opportunity to be in contention for the golden boot award. “I thank God for everything and I continue to pray to the living God that my wishes are granted,” Bokosi said. Bokosi( In red) Sets sights on the golden boot. The striker currently has 13 goals and he is competing with Silver Strikers forward Green Harawa who has 12 goals. “Though I didnt score in the last game against Airborne, I believe success is coming in the remaining games,” said Bokosi. Bokosi will get his chance sooner as the Reds, who are coming from a 3-0 victory over Airborne Rangers, will be meeting Blue eagles in a rematch at Kamuzu Stadium after the first game ended prematurely due to heavy rains. 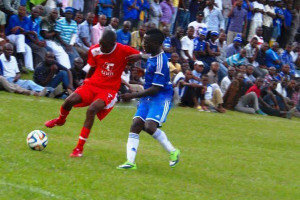 In the game, the Reds lost one nil through a a Wister Phiri slot. Red Lions are on position eight with 35 points and they are remaining with only four games to call it a season. Kodi anthuwo wowonelerawo ali mu stadium r kuti?kapinga wakongola . Koma #Malawi24 ndiye manyaka eni eni khani ya blueagles ndi reds zikukhuzana bwanji poika chithunzi cha nyasa bullets Ndi Mighty b4ward? ?kusonyeza kuti inuyo ku game kunalibeko mwangomvera sports news pa matindi.Makape. kkk ine ndimkawona ngati ndi zen-zen tu!